May flowers will bring a month-long celebration of cinema to Old Hollywood Films. * 2016 marks the 75th anniversary of the landmark film, Citizen Kane. 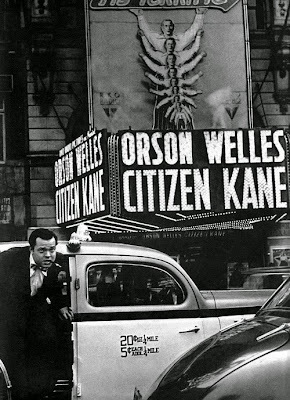 I'll continue my 1001 classic movie series every Monday with a look at Orson Welles' masterpiece and three other films that were nominated for a best picture Academy Award in 1941: The Maltese Falcon, The Little Foxes, and Sergeant York. * On May 6, I'll have a guide for TCM's star of the month, Robert Ryan. Plus, I'll have a TCM Viewer's Guide every Sunday. There's quite a few good blogathons coming up in May. *First, I'll review The Corn Is Green (1979) on May 12 for The Great Katharine Hepburn Blogathon. *I'll look at the life story of Helen Keller as depicted in The Miracle Worker (1962) on May 14 for The Disability in Film Blogathon. *I'll celebrate National Classic Movie Day on May 16 with the Five Movies on an Island Blogathon. *On May 18, I'll join The Great Villain Blogathon with an article about the character of Boris Lermontov (Anton Walbrook) in The Red Shoes (1948). * I'll cook up a strawberry-rhubarb pie recipe and a look at Ma and Pa Kettle for the Classic Movie Ice Cream Social on May 21. *I'll write about ballet sequences in Hollywood movies on April 25 for Gotta Dance! A Celebration of Dance in Film. *Finally, I'll review the classic story of a boy (Claude Jarman, Jr.) and his fawn in The Yearling (1946) on May 28 for The Animals in Film Blogathon. *Schedule permitting, I'll have a look at what's new on Netflix and DVD, and an article about Gregory Peck's life in film. You will be one busy girl.